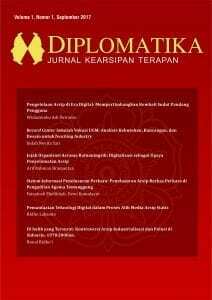 Diplomatika is a national academic journal for the study of applied archival science and its application in Indonesia. It is managed by Diploma Program of Applied Archival Science, Department of Language, Arts and Culture Management, Vocational School of Universitas Gadjah Mada in 2017 and published by Unit of Cooperation, Alumni, Publication, and PPM Department of Language, Arts and Cultural Management of Vocational School of UGM. The journal is published twice a year in March and September with ISSN 2598-0009 (online) and ISSN 2597-9981 (print). This journal aims to provide comprehensive and systematic knowledge that emphasize the applied aspect with the main study of records and archives. It encourages other relevant perspectives in the archives to broaden the horizons of science and contribute to the development of archival studies in Indonesia.